Dr. Joseph D. Alton M.D. ; Ms. Amy E. Alton R.N. Joseph Alton, MD practiced as a board-certified Obstetrician and Pelvic Surgeon for more than 25 years before retiring to devote his efforts to his new mission: To put a medical prepared person in every family for any disaster. He is an actively-licensed Life Fellow of the American College of Obstetrics and Gynecology and a retired fellow of the American College of Surgeons, has served as department chairman at local hospitals and as adjunct professor at local university nursing schools. He is a popular speaker at survival and preparedness conferences on the subject of medical readiness in austere times. A member of MENSA, Dr. Alton collects medical books from the 19th century to gain insight on off-the-grid medical protocols. Amy Alton, ARNP is an actively licensed Advanced Registered Nurse Practitioner and a Certified Nurse-Midwife. She has had years of experience working in large teaching institutions as well as smaller, family-oriented hospitals. Amy has extensive medicinal herb and vegetable gardens and works to include natural remedies into her strategies. She is also the designer of an entire line of medical kits and supplies, which can be found at store.doomandbloom.net. 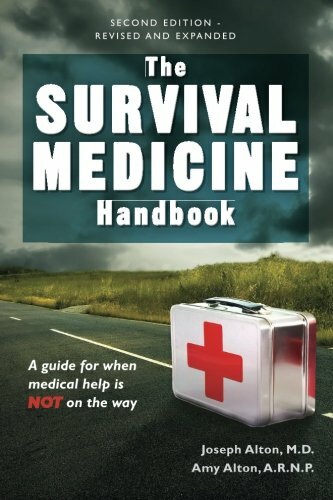 Dr. and Ms. Alton are regular contributors to American Survival Guide, Backwoods Home, Survival Quarterly, Prepare, Disaster Survival, Survivor’s Edge, and Survivalist magazines. Their website at www.doomandbloom.net has over 800 articles, podcasts, and videos on medical preparedness. As "Dr. Bones and Nurse Amy", they host a blog, YouTube channel, and radio program and are the designers of the board game “Doom and Bloom’s SURVIVAL”.